MUSICAL–Boone Central students and the pit orchestra rehearse for upcoming musical, Beauty and the Beast. 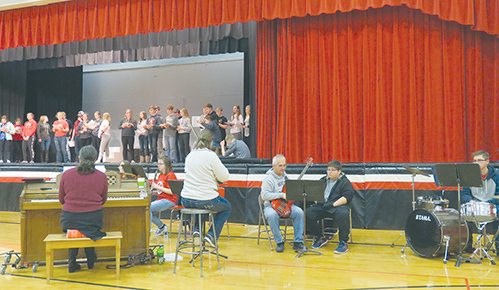 Boone Central High School students are preparing for their spring musical production, “Beauty and the Beast,” to be presented March 16, 17 and 18 in the school’s performance gym. The musical is an adaptation from Walt Disney Pictures’ Academy Award-winning 1991 animated musical film of the same name – which in turn had been based on the classic French fairy tale by Jeanne-Marie Leprince de Beaumont. The production features music by Alan Menken, lyrics by Howard Ashman and Tim Rice, and book by Linda Woolverton. 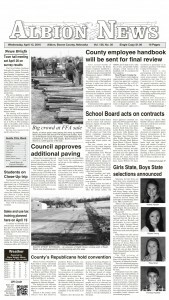 The first full-cast rehearsal was held Friday evening, Feb. 23. after school from 4:30-6:30 p.m. Many aspects of the production are now coming together, including set construction. The musical cast will be announced in the coming weeks. Show dates and times are: Friday, March 16, and Saturday, March 17, at 7 p.m. each night, followed by a matinee performance on Sunday, March 18, at 2 p.m.